It’s a credit to the depth of Canada’s vocal talent that Montreal Opera’s 14th annual Le Gala succeeded yesterday afternoon with an all-Canadian cast. 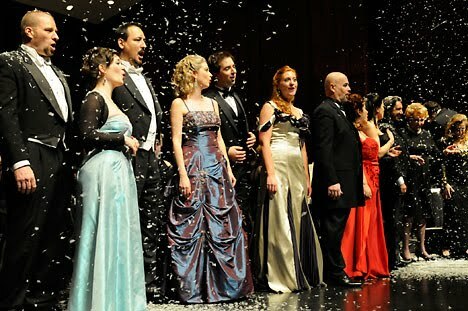 Twenty-eight singers and full opera chorus treated the capacity crowd of 2800 to 35 operatic solos, ensembles and chorus lasting over four pleasure-filled hours (including a 35-minute intermission). With a predominantly local cast, there were no cancellations and only Lyne Fortin was announced as indisposed, but she still agreed to perform. There were many high points starting with Gregory Dahl’s impressive and moving Rigoletto Act II aria “Cortigiani, vil razza dannata.” Dahl’s baritone had previously impressed in Montreal Opera’s season opener where his double performance as Tonio in Pagliacci and Schicchi in Gianni Schicchi revealed in him Canada’s next great Verdian baritone. Ample tone and impeccable legato are the order for a great Verdian baritone, and Dahl’s performance of the Rigoletto aria and the famous “Te Deum” from Tosca did not disappoint. Soprano Marianne Fiset brought beautiful legato and heart felt feeling to Puccini’s “O mio babbino caro” from Gianni Schicchi. Montreal native mezzo-soprano Nora Sourouzian’s Act I aria from Carmen was sung with beautifully projected voice and professional presence; my only complaint is that she was only asked to sing this short aria. Let’s hope Sourouzian, who has been away from Montreal for ten years and now makes Switzerland home, would be brought back soon. The revelation of the evening was Layla Claire’s touching and vulnerable performance of “Adieu notre petite table” from Massenet’s Manon; her perfect technique allowed her voice to swell and bloom. Aaron St. Clair Nicholson’s engaging voice and presence (including a cell phone and juggling schtick) in the Barber of Seville aria “Largo al factotum” brought the house down. 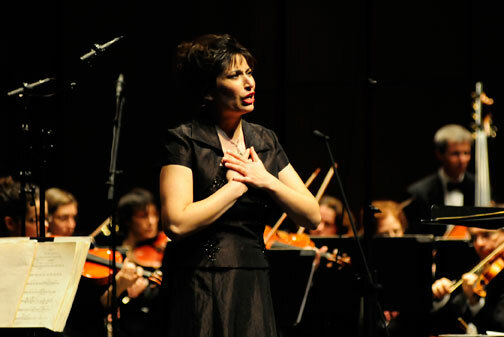 Soprano Aline Kutan’s performance of solo and duet from Lakmé proved again that she’s Canada’s top coloratura. Coloratura soprano Raphaëlle Paquette also acquitted herself well in an aria from Thomas’s Mignon. The Gala also revealed that recent graduates of the Montreal Opera’s Apprenticeship program have matured and are ready to join the solo ranks. Baritone Etienne Dupuis showed a solid clear voice in his noble performance of Valentine’s aria “Avant de quitter ces lieux” from Gounod’s Faust. Bass-baritone Alexandre Sylvestre’s rendition of “O du mein holder Abendstern” from Wagner’s Tannhäuser had a fine legato and evenness of tone. Baritone Phillip Addis demonstrated a well-projected voice in a boring aria from Bizet’s Pearl Fishers. Top marks also for soprano Marianne Lambert, tenor Antoine Bélanger, who is showing an Italianated tenor voice, and current Atelier Lyrique member Caroline Bleau who exceeded expectations in her Traviata duet with veteran baritone Gaétan Laperrière. Other noteworthy veterans included Annamaria Popescu, Lyne Fortin and Marc Hervieux, who gave a preview of “Le vaisseau d’or” from the upcoming Spring performance of Nelligan. Conductor Alain Trudel and the Orchestre Métropolitain provided fine support throughout, and the chorus was excellent in their three pieces. In the first half, Le Gala showcased the three winners of the Montreal Opera’s amateur competition Apéro à l’Opéra: mezzo Lise Brunelle, and sopranos Sophie Lemaire and Annie Sanschagrin. Based on the performances heard yesterday, there was no clear cut winner; after intermission, Montreal Opera artistic director Michel Beaulac announced Sanschagrin as the grand winner, with her prize, the performance of a duet (with tenor David Pomeroy) and Vissi d’arte at the end of the February 13 performance of Tosca. The Gala began with a touching tribute to the late Father Lindsay who was inducted into the Canadian Opera Hall of Fame. The homage would have been perfect had the organizers prepared a video presentation, an element sadly missing every year. All in all, this was a thoroughly enjoyable evening. Disappointments include not hearing in solo mezzo Stephanie Marshall, another Canadian who has been making a name for herself in Europe, and why were Fiset and Addis not given arias different from the roles they just performed with the Montreal Opera. Also, missing this year were large female voices, as Canada seems to be following the world shortage in Verdian spinto sopranos. Otherwise, kudos to Beaulac for the fine programming. Addendum: Le Gala was recorded by Espace musique and will be broadcast on Dec. 26 at 1 p.m. on the program l'Opéra du samedi hosted by Sylvia L'Écuyer, and will be issued on CD by ATMA Classique on January 30, 2010.